Tanglewood at dusk is a magical setting for a summer’s eve concert. There are almost as many stars on stage as in the sky above Tanglewood Music Center, summer home of the Boston Symphony Orchestra in Lenox, Mass., and one of the world's most beloved settings to enjoy music. 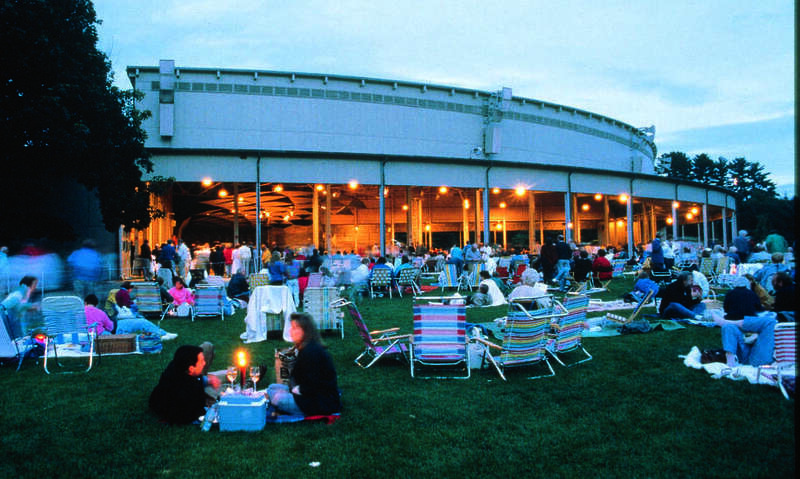 Tanglewood is a unique mélange of great music and an idyllic setting where thousands of patrons sit in the covered shed, which has seating for 5,000, or set out picnic blankets and lawn chairs under the stars. This year's luminous line-up features celebrated classical musicians, including violinist and conductor Pinchas Zukerman, violinist Joshua Bell, soprano Renée Fleming, pianist Emanuel Ax, and composer John Williams; and cultural icons Seth McFarlane, James Taylor, Chick Corea, Dolly Parton and Garrison Keillor. "We always do a mix of styles, classical and popular," said Anthony Fogg, artistic administrator and director of Tanglewood. For the 76th anniversary season this summer, Tanglewood is devoting the early part of the season to the popular artists, while the main portion of the season is dedicated to the classical offerings, he said. The season-opening performance in the Koussevitzky Music Shed on June 17 marks Dolly Parton's Tanglewood debut. The opening weekend of the BSO's 2016 Tanglewood season features Joshua Bell on July 8 and Carl Orff's Carmina Burana on July 9, and a special guest appearance by Seth MacFarlane with Keith Lockhart and the Boston Pops Orchestra on July 10. This summer, Tanglewood will welcome back renowned conductor Seiji Ozawa for the first time in 10 years. Ozawa served as music director for the Boston Symphony for 29 years, the longest tenure of any music director there. "We are delighted that he is returning to Tanglewood," Fogg said. Ozawa will conduct Beethoven's "Egmont Overture" on July 9 and will work with music students. One of the most popular events for audiences is the John Williams' Film Night. Williams, the prolific composer and multi-Academy Award winner has written the scores for Jaws, E.T., Jurassic Park, several of the Harry Potter films and the Indiana Jones series. His most recognizable music is probably the theme for the Star Wars movies. The program for Williams' Night on Aug. 13 is not finalized but even Fogg has his fingers crossed for a particular piece of music. "On my wish list is that John will include music from the most recent Star Wars film," he said. This year's season will see a change in the start time of evening concerts. Fogg said the programs will move up from 8:30 to 8 p.m., and will finish around or just after 10 p.m., allowing for an easier commute for those audience members who travel some distance, while allowing local patrons more time to go out for dinner or drinks afterward. The attendance at each concert is significant and Fogg said that indicates a continued interest in a great art form. People often bring their own picnic dinners and beverages, some of them setting up elaborate banquets with fine china and linen. Patrons can also purchase pre-ordered meals on site including picnic and restaurant style dining. Fogg said the culinary offerings cater to all dining preferences from the pricey high end to the casual less expensive. Concert tickets are on sale now. For tickets, detailed information and a full listing of concerts visit www.bso.org.